Located on Throgmorton Street in the shadow of the old Stock Exchange, which, incidentally is currently being developed by Hammerson from the archetects Grimshaw the new Stock Exchange is now near St Paul's in Paternoster Square. The name arbitrage is a financial term for simultaneous purchase and sale. Upstairs is small (downstairs was closed on my visit, due to lack of customers, there was only one bar man) with a few stools at the bar and had a local feel to it, it seems most of the clientel new each other. They have no ales, just lagers and Guinness , I had '1664'. 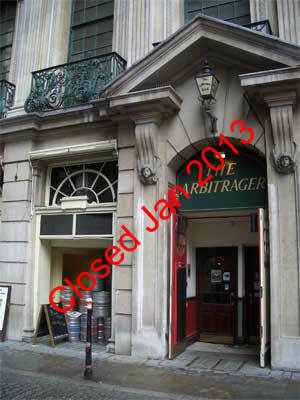 I have noticed that the pub is sometimes closed on a Monday. Throgmorton Street is named after Sir Nicholas Throkmorton, servant of Queen Elizabeth, his tomb can be seen in the church of St. Katherine Cree located on Leadenhall Street near Leadenhall Market.